Hello there, my Soulsters! What’s the good word? I am ending the week with a giveaway, can it get any better than that? Let’s jump in. I am really looking forward to the many directions that this conversation will go, the stream of issues that it will touch, and the awakening of so many different levels of understanding that we haven’t touched in a long while with each other. It really is going to be a thought-provoking event that you do not want to miss. 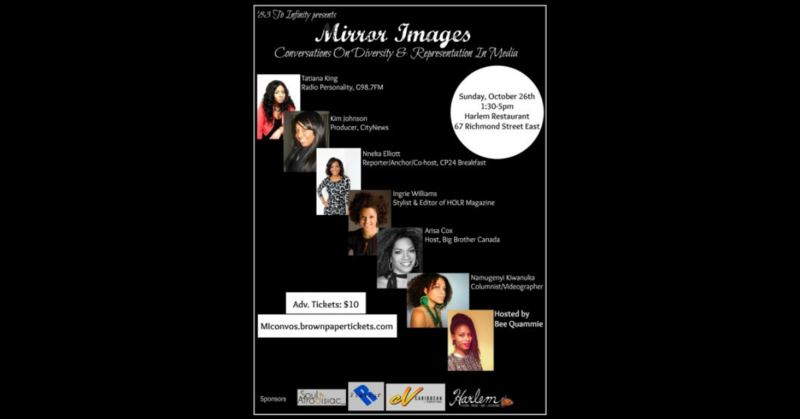 With that being said, I am giving away a pair of tickets to a lucky Toronto Soulsters to head on over to Mirror Images on Sunday, October 26th! But of course, you can get more information about the event and tickets right here. Enter your info in the form below and I will draw a random winner and make the announcement on Thursday, October 23rd. – The contest starts now, as of this post! The deadline for entries will be on Wednesday, October 22nd, 2014 at midnight. – The winner will be notified by email and text message on Thursday, October 22nd.